Carboxytherapy is a mesotherapy like non-surgical procedure used to infuse CO2 gas below the skin (sub-cutaneous or intradermic) through a thin 30G mesotherapy needle. Treatments are quick, comfortable, effective with no down time. CO2 gas stimulates blood flow with several consequences: skin elasticity improvement, peau d'orange cellulite reduction, localized fat reduction and collagen production stimulation. Carboxytherapy is a good alternative to liposuction for person who are not willing to go through anesthesia and surgical operations. Carboxytherapy has now become a good anti-aging treatment for cellulite of all grades, for wrinkles reduction, stretch marks. Carboxytherapy is a FDA approved treatment. Carboxytherapy works in two different ways: it first fragilizes fat cells with a pressure traumatism, then, in second, CO2 leads to flood vassels dilation in the area where the gas is injected. This reaction to carbon dioxide injection gives a better oxygenation of skin layers with increased lipolysis capabilities. The end result is fewer fat cells and skin tightening..
Liposuction complementary solution to clear pending irregularities. The number of sessions differs and are related to the kind of performed treatment. Localized fat reduction typically requires from 8 to 10 sessions for an optimal result. Sessions should be renewed eash 1 or 2 weeks. Several yearly sessions are necessary to maintain results. For cellulite and peau d'orange, from 6 to 10 sessions are also required for optimum results.They should be renewed each each one or two weeks. Results may be optimized with cellu-m6 or velasmooth massages. Treatments for stretch marks and wrinkles will require from 4 to 6 sessions repeated each month. Carbon dioxide is non toxic. Carbon dioxide is naturally produced by the cells in our bodies every day. It is a product of normal metabolism, where it is transported in the blood and exhaled. Side effects are minimal and resolve very quickly, and include mild pain at the injection site, a crackling sensation of the skin, and possible bruising of the tissues, which did not leave any lasting esthetic effects, and all of which are self limiting. Necessary precautions after any co2 session ? Avoid emerging in cold water for 4 hours after the treatment such as baths and swimming. How does carboxytherapy work for dark under eye circles? One major cause of dark under eye circles is vascular pooling. The capillary network of the lower eyelids can become congested for a variety of reasons. Normally, the tears drain from the eyelids into the nose, but if there is some obstruction due to chronic nasal congestion from seasonal allergies, previous nasal fracture, or a deviated septum, the drainage doesn't function well, and the blood flow to the lower eyelids becomes sluggish, giving rise to the boggy blue tinge known casually as allergic shiners. The lack of appropriate oxygenation to the lower eyelid skin allows the bluish cast to show through the thin skin of the eyelids. Carboxytherapy works to improve the capillary network of the lower eyelids, as well as to increase the dermal collagen layer in the lower eyelid skin. 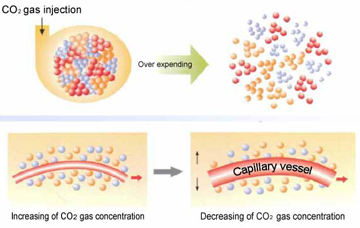 By injecting a small amount of carbon dioxide gas into the affected areas, blood flow is increased and improved capillary networks are formed for longer lasting circulatory benefit. The bluish cast is replaced with a healthy pink tone. Once a series of treatments is completed, the skin has a more luminous appearance that lasts approximately six months. .
How does carboxytherapy work for alopecia? The conditions that cause or are caused by circulation compromise, are the conditions that can be treated with this modality due to the revascularization and improvements in micro circulation caused by this therapy. Thus carboxytherapy has been known to also treat acute arthritis, erectile dysfunction, rheumatology and raynauds syndrome. If carboxytherapy is used to melt fat, won?t it make my eyelids hollow? Carboxytherapy doesn't hurt; it just feels a little weird. Because of differences in the techniques used to treat the eyelids, stretch-marks, scars, and fat deposits, the sensation is slightly different depending upon what is actually being treated. I use numbing cream for all of my patients to diminish any discomfort associated with the pin-prick of the needle itself. When treating the eyelids, I tell my patients that the lower eyelids will feel puffy, like they were up crying all night, but that will subside once the gas is absorbed over the next five to ten minutes. The treatment of stretch-marks and scars is relatively painless because this skin doesn?t have the same ability to sense pain. Some pressure from the gas may be felt as the stretch-marks are distended, and they can feel a bit itchy, but again this subsides in about five minutes once the gas is absorbed by the body. Scars generally feel no pain because there are no nerves in scar tissue. The treatment of cellulite and fatty deposits on the arms, abdomen, and legs has a unique sensation of its own. This is because a larger amount of the gas is injected directly into the offending fat deposits and allowed to expand. While the gas is expanding, you may feel some pressure in the area being treated that feels similar to when the arm is squeezed by a blood pressure cuff. The areas will feel warm and tingly for up to 24 hours after the treatment as the circulation to the area is improved. Stretchmarks (striae distensae) occur when the skin is stretched to the pThis depends upon the severity of the problem being treated. Usually, six to twelve treatments spaced one week apart yields an excellent result. The only real possible side effect of carboxytherapy is the potential for a bruise at the injection site. Usually, the eyelids can be treated without leaving any marks, making it a truly no-downtime procedure. Bruising is very common when treating the arms and legs, so carboxytherapy might not be a good idea if you plan on wearing a bikini the following week during vacation.